Did you know that you can experience Silverton Mountain privately for as little as $9,990 per day? It’s a great opportunity for your next fundraiser, party or reunion. Your group can enjoy exclusive, guided access to Silverton Mountain’s chair-accessible terrain. The private mountain is most commonly rented for charity/non-profit fundraisers. It’s a great way to give and have a great day at the same time! At only $250 per guest for 40 guests, contributions will go farther towards your fundraising goals. Our friendly staff will be on site to accommodate guests with on-site food & beverage amenities, including a full bar, as well as a toasty wood stove for warmth and community. Want to give your staff a holiday party they’ll truly enjoy? Booking the entire mountain gives guests an unforgettable, team building adventure. With eight people per guided group, our guides will manage movement around the mountain. Your team can focus on your epic shred day instead of guiding & logistics! An adventure day at Silverton Mountain will help your staff forge bonds with the thrill of skiing and snowboarding in the San Juans! Looking for an unconventional solution to your family reunion planning? Silverton is an amazing place to visit for the entire family. With a quaint downtown, rich local history and plenty of lodging options Silverton is a beautiful backdrop for your next family getaway. Not sure if Uncle Dan has the chops to ski the steeps at Silverton? Kendall Mountain is a great alternative ski area for beginner and intermediate skiers to practice those turns while you enjoy your private mountain experience at Silverton Mountain. The holidays are coming soon, and you can surprise your family with an unforgettable adventure getaway. You’ll be the favorite at every family gathering! 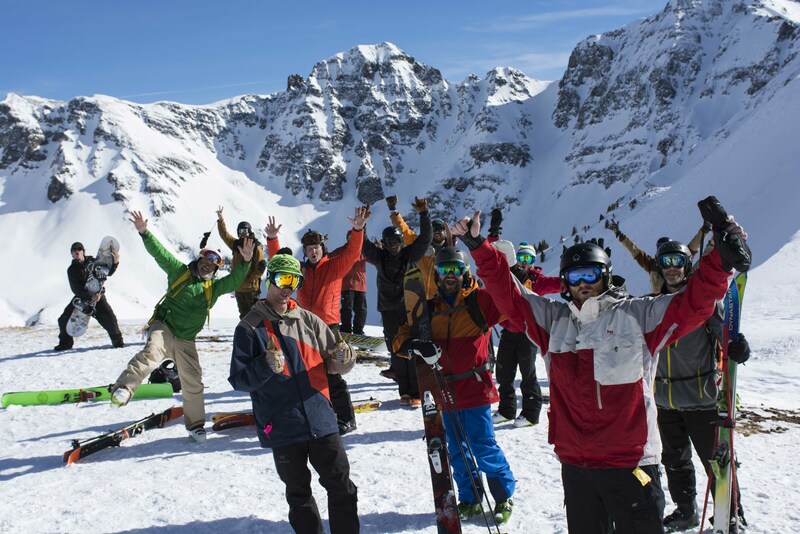 Give your friends and family epic memories from your private mountain experience at Silverton Mountain. Our guides take out all hassle and give your group the thrilling solitude of a private mountain. Whatever the occasion, nothing is sweeter than Steep & Deep! The pricing varies depending on the time of season, day of the week, and group size. Our base price of $9,990 is for a max of 40 people, but requests for larger groups can be accommodated. Private mountain rental is available starting 11/24 of each season which makes it a great option for your company holiday party. We offer food and beverage options, rental equipment, and other commemorative swag at additional costs. Tell us your vision and we will help make your event memorable! From 12/27 -4/14 private mountain rentals are normally limited to Mon-Weds (Thurs-Sun if you book well in advance). Private mountain rentals are available DAILY from November 24 – December 26. Make your reservation today for your next 2018 holiday event! For those of us who were around waaaay back in the early days when we were only allowed a few people each day they will tell you that the conditions in December with few people on the mountain were some of the best of all time. With consistent early season snow at Colorado’s highest ski area, the season comes in early!